After the meet, I am ususally a bit burned out by STG's, so I tend to play RPG's for a while after it ends, getting my drive back. This year, I decided to pick up FFV for the GBA - a game I have had in the collection for a while, but haven't played. It usually takes alot to keep me going nowadays in an RPG and I find myself tending towards the Shin Megami Tensei RPG's and their difficult battle system and dark story, rather than FF titles, but FFV has got me hooked. The job system is excellent, letting you level up jobs for each character to get specific abilities that transfer to another job class once you have learned them. So, you can have a white mage who also can fight two-handed or a black mage who can use a dragoon's jumping attack. The amount of different jobs is impressive and enjoyable to work with in the confines of traditional FF RPG. The story is typical FF fare, with crystal shards that need to be gathered to topple the big boss, Exdeath. However, this takes place between two different worlds, with a quick real time battle system and a fun - if incredibly melodramatic - story. 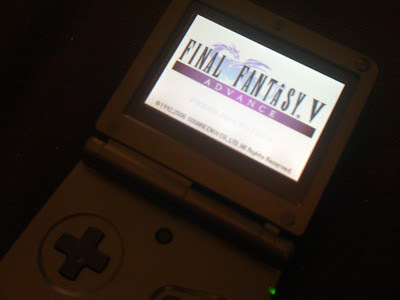 I find myself playing it like I did FFI back in the day - staring at the screen for hours, saying, I'll turn it off right after the next battle, and then staying on it for an hour more. Really enjoyable and a good distraction from STG's for sure. Interesting enough, that's kinda how I feel as well. After playing Pink Sweets/Pork and going to the meet, I just felt pretty shmupped out for a while and aside from playing a few random downloadable Xbox games, I started to get back into a few RPGs, mainly the Dragon Quest series and have been pretty content with passing the time that way. There's definitely a time and a place for RPGs in most dedicated gamer's lives, you just have to wait for it to show up every once in a while and have balance between STG/Action/RPGs, etc. This is just plain silly talk. Ha - yeah, I feel the itch returning to play some shmups and I haven't had Andi over for ages - maybe that will help get me stoked again.